While I haven’t felt that the other Telltale games drive me to finish them, I am working at going back to finish the others that I’ve started simply because they deserve my time. It’s just hard when a game doesn’t grip you enough or build that desire to play them through. I’ve not even started the Game of Thrones or Borderlands versions. The only exception would be The Wolf Among Us that simply stopped working and no matter what I tried to do to get the game to work again it simply failed and I got no support from anyone (which sucked). Batman is a wildly different monster. It is very exciting and engaging and I simply cannot wait to play through the rest of the episodes. So release them already! Batman is awesome. If you don’t believe that, then you’re probably a Superman fan. If that’s the case… that’s fine, but Batman is still cooler. As with all of the Telltale games out there Batman does have its fair share of action that are done with quick-time events. If you’re not a fan of story-driven plots and QTE gameplay as the main way to explore the narrative, none of the Telltales games are for you. You don’t get the action/adventure feel as you would with the other main-stream Batman games available currently, but the combat that is included is still very intense and well implemented. I don’t think I could do with a whole game based on that gameplay solely, but when it’s sprinkled into the story it works very well. 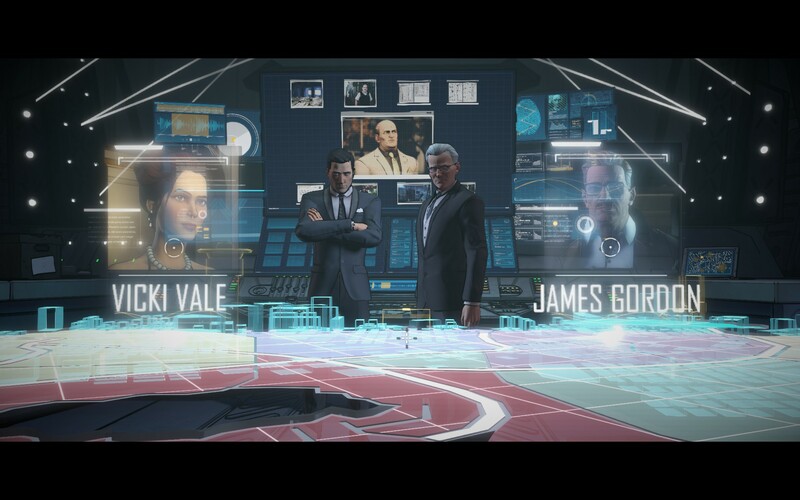 It’s also enough and I’m not left wanting more lamenting that the action is over because the Bruce Wayne half of the game is also very well done. 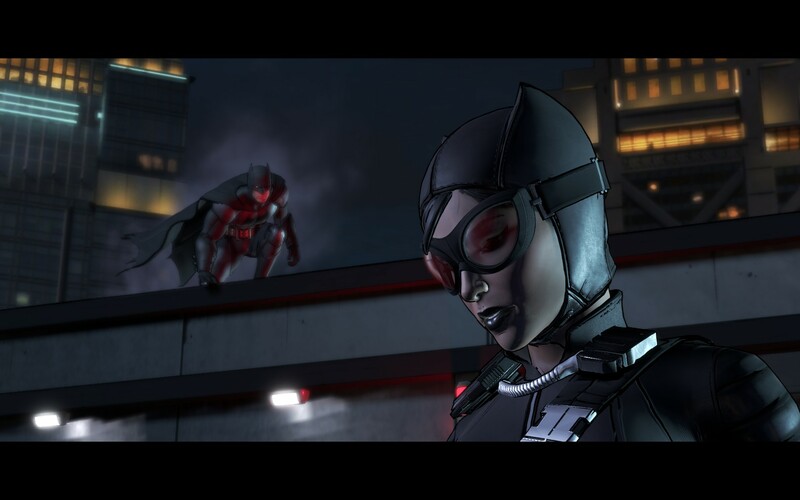 Catwoman senses a QTE fight sequence incoming. What she doesn’t know is that I’m about to wreck her something fierce. How does playing as Bruce Wayne pan out? Pretty well. With Batman, you’re choices don’t come across as overly complicated. Punch a guy or not punch a guy. Break an arm or show mercy. When you play as Bruce, you start getting into the politics and how you relate to other people and it’s effects of how other people see you. Also, it affects how the news papers report on you. Did you shake hands with a known criminal or burn him with leaving his hand hanging. It can get nerve-wracking trying to decide which option is the best and/or would push the narrative that you want to follow. This is also where the game can fall apart for me. Not enough to be game breaking, but it can become very annoying as some on the Steam reviews can attest to the same sentiment and it’s not because there is so little time to pick. Choices… it’s what matters in this game… after they patch out where your choices don’t matter because they will just have default dialogue that will assume you did what they wanted so they didn’t have to record more than one option at times. Some choices are not as clear-cut as they appear in my head. The above mentioned hand-shake was an example of me not wanting to be rude, but then everyone jumped to the conclusion that I was welcoming a known felon into my house. I’m just not a jerk. He showed up and offered a hand and I took it. You know how you feel when someone doesn’t shake your hand. I didn’t want this to take a downward spiral when it first started. However, some of the options look like one thing and then the conversation takes the different turn and you’re left wondering what just happened. I was trying to be civil and that was the “jerk” option. Maybe if they labeled the options with things like, aggressive, polite or stoic. It might help rather than trying to infer what the developers decided they meant with the small sentence they give to represent your next step in the conversations. Lots of emotions for a scene that you’ve probably seen or read a few hundred times and still gets me all ready to punch baddies in the face! The last thing to note would be that while they say that your choices matter, I think it might be better stated that only some of your choices matter because some of them will be ignored. While I’ve read some comments about you as Bruce not giving a statement to the press when you clearly did, my issue lies with when I was Batman. I was in a warehouse and I punched a bad guy in the face and then applied some pressure on his elbow. That was literally it. I didn’t break anything other than his pride probably. The next scene Alfred is berating me for beating the man half to death. Beating him half to death!? With a punch in the face? I know Batman is strong, but he was able to give me coherent answers after I did it too. 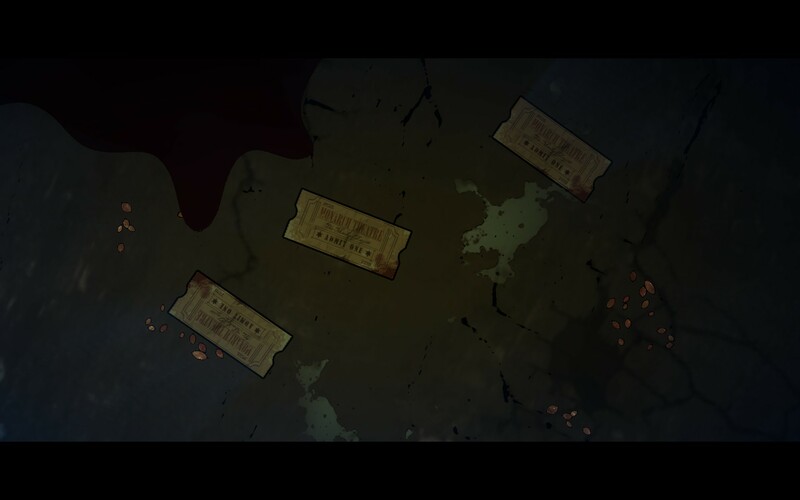 It broke the immersion of the game completely at that point and that was near the end of the first episode. That’s how you don’t end with a high note. 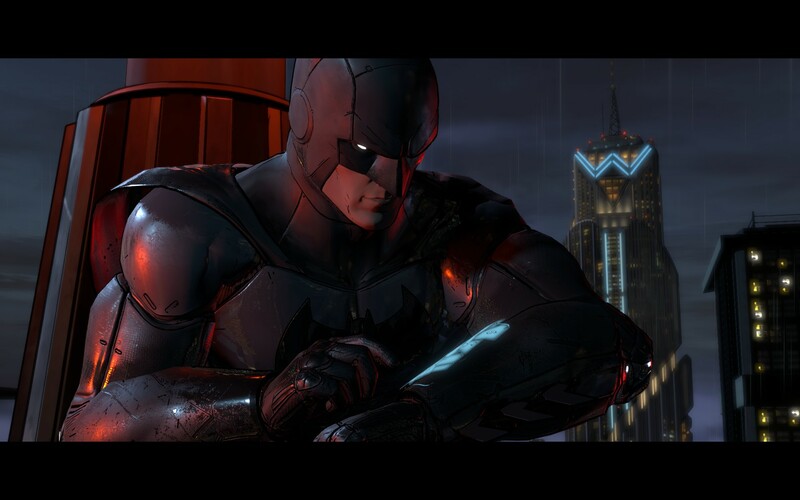 One last thing to note is that this isn’t your five-year-olds Batman game. People get shot in the face and brains are on the floor. While not a problem for me because it’s not a Guy Richie movie, I unfortunately cannot share this adventure with my kids who are way too young for this content at this time. Also, the language is a bit much because you know how kids repeat things. My daughter tells me she won’t, but I don’t believe her. She’s nearly four and full of lies; she’ll say anything to watch Batman. (Also, my wife would beat me if she walked in and heard/saw some of the content and my daughter on my lap.) All of this adds to the game making Gotham come off as legitimately gritty and in some areas, just a crappy dump-hole of a place to live. This doesn’t get portrayed well in movies since they tend to stick to the PG13 rating and I’m fine with that in cinema. Man, it adds a whole new level to the universe in as small of a departure that it is. 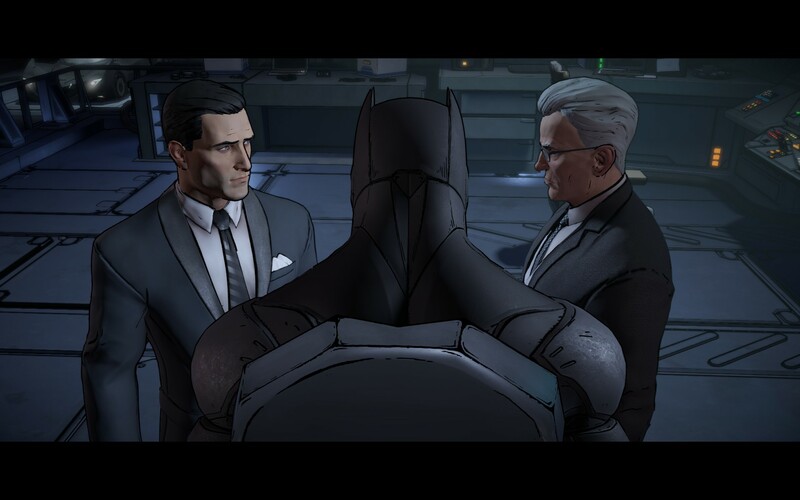 By far, the Batman Telltale game is my favorite game in this franchise so far. The QTE action works very well sprinkled in with the plot driven story. There are issues with the choice system, but the rest of the game is so good I’m willing to give more episodes a chance because I believe this shouldn’t be the way the rest of the game works out. I have hope that they will get their stuff together after this. This one has too much potential to ruin for the sake of my sanity… do it right guys and gals!